Lord Ashcroft’s Scottish seat polling is out, and he certainly delivered on his “humdinger” billing. Of the 14 Labour-held seats polled, every one showed a swing of over 20% to the SNP, with the average just short of a by-election-esque 25%, giving the nationalists the lead in all but one of them (Glasgow North East). That Labour is behind in so much of Glasgow is extraordinary – to put it into perspective, Labour has won every seat in the city at every general election in the last three decades. Not since Roy Jenkins and the SDP triumphed at Hillhead in 1983 has any other party had a look in on election day. As John Curtice points out, the limited good news for Labour is that they aren’t too far behind (single digits in 7 of the polled seats). Also of note was that for Labour incumbents, there was no discernible difference between the first question (standard voting intention) and the second (which refers to the specific consituency and candidates, without using their names). For the Lib Dems there was a five-point gain, which is less than has typically been found south of the border. Lord Ashcroft only polled two Lib Dem-held seats so the overall pattern there is less clear, but it now seems that Drew Hendry has a near-insurmountable lead over Danny Alexander in Inverness et al. and that Christine Jardine is trailing Alex Salmond in Gordon, where Sir Malcolm Bruce is standing down. So it appears that the SNP’s best-case scenario, where its gains are in exactly the places it needs them, is materialising. But that also depends on the rest of Scotland. How might other Labour-held seats look? The interesting thing about the 14 Labour seats in this round of polling was just how red they were. In 2010, they accounted for 28% of Labour votes in the whole of Scotland. Lord Ashcroft didn’t produce a Scotland-wide poll, but as I wrote on Sunday, he seems to arrive at similar Scottish results to YouGov, as his apparent fieldwork providers Populus did when they polled Scotland by phone. 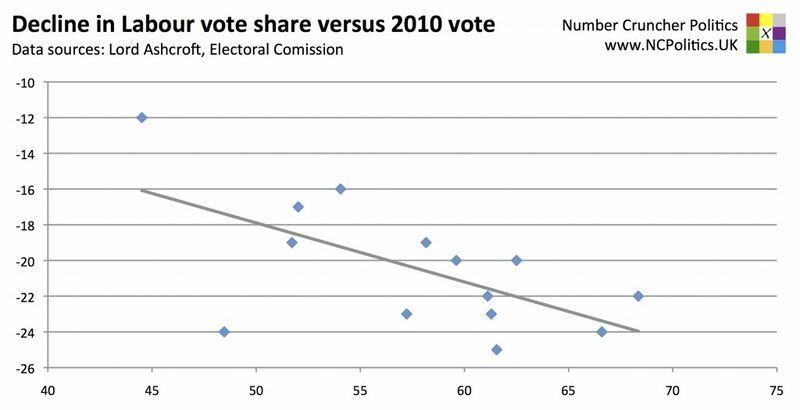 There were 506k votes in these seats in 2010, versus 1.959M in the rest of Scotland in 2010, so combining the seat vote shares and a national vote share of 27%, (assuming no wild changes in the pattern of turnout within Scotland), Labour must have lost about 743k votes (13.5 points) in the unpolled seats. Repeating this for the SNP and a 47% national share gives us a gain of 525k votes or a little under 27 points in the unpolled seats. So it appears that the SNP has gained just as much in the other seats as these, though Labour’s losses are smaller and a greater part of the nationalists’ gains have come from other parties. This all adds up to a “rest of Scotland” swing of 20.2%. 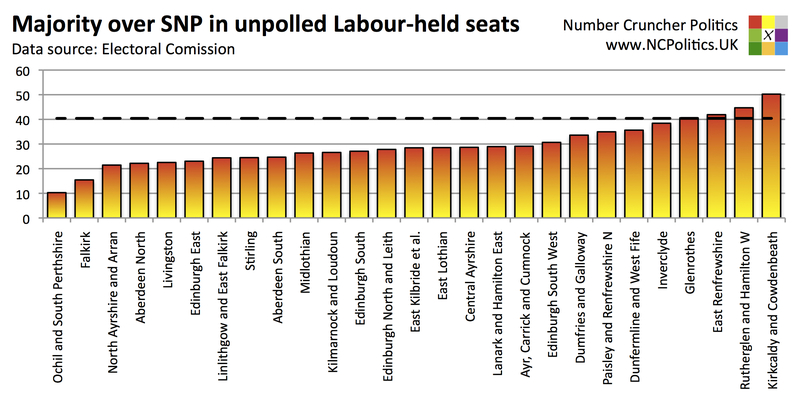 Applied uniformly across Labour’s 27 unpolled Scottish seats, four of them (the ones with majorities greater than 40.4%, indicated by the dashed line on the chart) would stay red, alongside Glasgow East. But how will the swing actually look? Here are two non-uniform scenarios, the “indyref” correlation scenario and the “semi-proportional” scenario. If the swings are smaller in areas that voted “No”, the SNP could fall short in places like Edinburgh, the Lothians and Dumfries & Galloway. The trouble for Labour is firstly that those seats tend to have smaller majorities than the “Yes” areas and secondly, although the referendum voting pattern showed geographic variation, it didn’t vary that much. If we exclude Orkney & Shetland, whose seat is Lib Dem-held (their safest in the UK, by some distance), the atypical south, and Renfrewshire East, whose seat is already one of the theoretical holds, there were just five local authorities where the “No” percentage exceeded the national average of 55.3% by more than 5 points. Looking at the chart above, there are only five seats where a 5% reduction in the swing (ie 10 points on the majortity) would change the outcome relative to a uniform swing. But if the effect were bigger than that, and in the right places, Labour could hold on in more seats, as it could through other seat-to seat variation. Double digits could then be on the cards. In other words, the 40.4% line on the first chart, instead of being flat, would become positively sloped, with even the safest unpolled seats Labour coming into play. That seems unlikely, but it does illustrate John Curtice’s point that “there is hardly a safe Labour seat left in Scotland”. I’m not aware of any other imminent polling in Scotland, but the good news is that Lord Ashcroft has promised another round of Scottish constituency work at some point.